Lots of recliners advertise fancy features and come with all the bells and whistles. But, let’s face it: what we really want to know is “is it good to sleep in?”. Sure, we also want something that’s comfortable enough that we can binge watch our favorite shows in it or relax after a hard day’s work, but after a bit, we’re probably going to fall asleep in the recliner with the tv still going. . So, it’s good to know that there are recliners that are roomy, comfortable and won’t make us get a crick in the neck when we inevitably fall asleep in them. Lucky for you, I’ve researched them for you and compiled a list of the best recliners for sleeping, and they can all be purchased on Amazon, making furniture shopping simple and safe. By the end of this article, you should be able to find what to look for in a recliner before you buy, what counts as a standout feature and what’s pretty standard. And, hopefully, you’ll be able to figure out which one is right for you, your needs and your price range. Here is a list of the top 10 Best Recliners for Sleeping. 1.5 6. 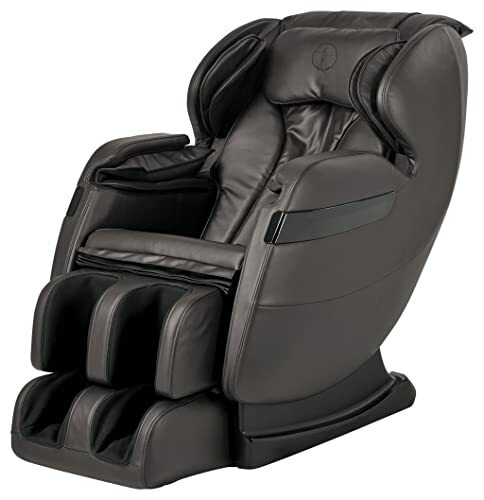 Suncoo Massage Recliner (Power Recliner- Black- 13 IN 1) – Great Features and Price. This recliner is an excellent choice if you have back pain, because it’s the only one on the list to be FDA registered as a medical device. It has 8 different massage points in the back and 50 air bags located throughout the legs, seat, arms and shoulders and pulsed massage in the arms for maximum massage coverage. There are 4 preset auto massage settings and 2 heaters (one in the seat and one in the foot area). In the foot area, there are massage rollers and the foot rest extends to accommodate taller people. You can access all of the massage options and all of the chair’s features via an HD VFD display screen. It also does zero-gravity reclining, for a weightless, comfortable sleep. As if all of that weren’t enough, it has a built in music player, complete with bluetooth capability, a USB port, an AUX port and a tf/sd card slot. You can use the USB port to charge your phone while you nap. It comes pre-loaded with relaxing, spa-type music, but you can also listen to your own to get you in the mood to relax. It doesn’t come pre-assembled, rather coming in 3 different boxes: the seat, arm rests and back. But, given that there are only three boxes, it’s pretty easy to put together and only a minor inconvenience in exchange for all of the quality features this recliner has to offer. Music player with Bluetooth, AUX and Pre-loaded music to help you relax and sleep. Comes in 3 different boxes that will probably arrive separately at different times. This is a great option if you want a massage chair with plenty of functions without having to do much to assemble it. It has what they call a “true back rolling system” as opposed to a fixed point massage. There are 7 different massage variation settings, which include: knocking, kneading, shiatsu, tapping, rolling, vibration and a combination of tapping and knocking. There are 4 auto massage programs that incorporate the massage variations (stretch, relax, swing and recover). It has a stretch mode, or yoga stretch, which is seen on other models in a similar fashion, but this model covers a larger pull area than most models. It also has heat therapy, which is always great on the back. In the foot area, there are rollers for massage and acupressure for the calves, which is nice because most massage chairs don’t cover the calves. The foot rest also extends an impressive 8 inches for taller people. There’s a 5 year warranty on the frame and parts, and 3 years on the electronics, along with a 10 day return policy. It comes fully assembled, which is nice for those of us who aren’t handy. 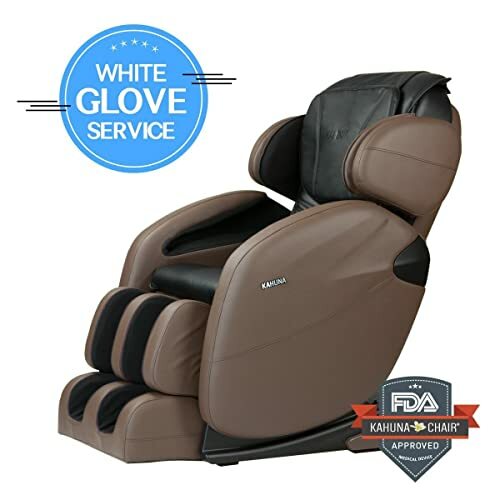 This recliner is getting rave reviews that praise the company’s customer service and say that the recliner lessens back pain. May not be good for heavy people. This option is great for those who are limited on space. It uses space-saving technology to slide the chair forward while reclined. Because of this, you only need 3 inches between it and the wall, which is far less than some other models that don’t conserve space. 3 stages of zero-gravity are featured, as well. It uses a smart body scan to detect the size and shape of your body to give you a custom tailored massage. It has an L-Track massage system that supports the neck and back, while decompressing them and providing a more effective massage. An air cell system massages the shoulders, arms, waist and hips. Heat therapy is incorporated in the lower back and legs, which could come in handy if you suffer from lower back pain. There are 6 different auto massage programs, and among them is a yoga stretch for full-body stretching. The foot area, which has massage rollers in it, has detachable parts that you can clean, preventing and eliminating odors. This is great for the neat freaks and germophobes out there. There is a warranty for 3 years on parts, labor and the structural framework that you can register for on their website. The only real downside is that not only do you have to download the manual, it doesn’t come pre-assembled. Instead, they offer an instructional video on YouTube, claiming that it’s easy to understand. Detachable and cleanable parts in the foot area. Assembly required via YouTube instructional video. Manual for the chair is downloadable, rather than a physical copy. 4. 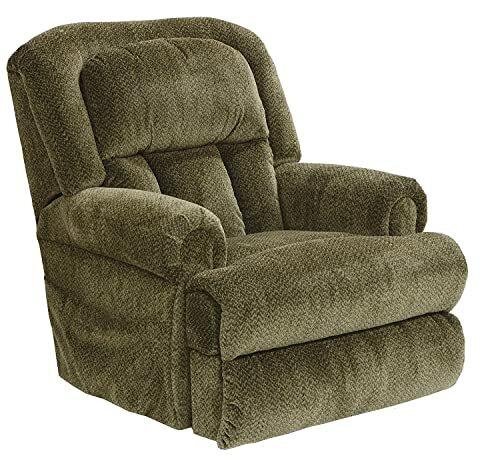 Catnapper Burns 4847 Power Dual Motor Infinite Position Full Lay Flat Lift Chair Recliner – Best for Durability. 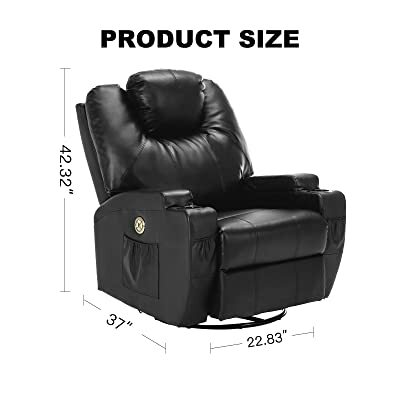 This is a good choice for heavier people, or if you want a strong, sturdy recliner. It’s cushy and comfortable, providing great lumbar support. It has an extra wide seat, with the seat box being made of steel. There’s a powerful 24v motor that operates the chair, providing multiple seating positions. It’s a dual motor system, which means that the back is capable of moving independently of the foot rest at the touch of a button on it’s remote control. You can even charge your devices via a USB port on the remote, making for simple charging while you nap. It even has a battery backup, (9v, not included) which is great in case the power goes out. 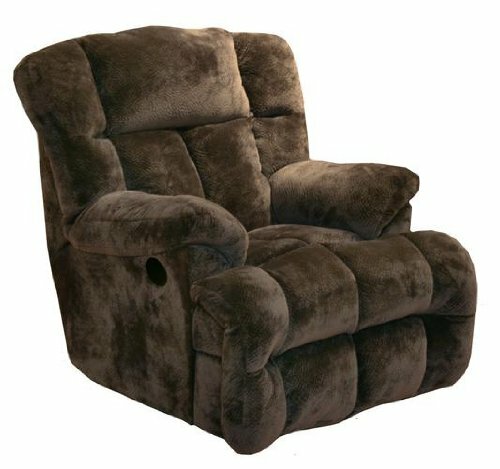 The recliner is upholstered with a heavy-duty, woven velvet fabric that comes in 4 colors. The fabric itself is very durable and strong. The whole chair is fire- retardant, meaning that the recliner will even withstand fire. But, if you’re still concerned about your investment, there’s a 1 year warranty that comes with it and a 5 year extended warranty is available. May not be a good choice for tall people. Chemicals to make it fire retardant. 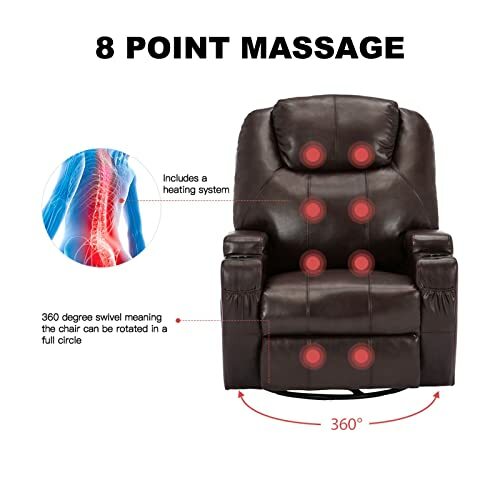 This chair was top rated by http://massagechairsexpert.com, which is an independent website that isn’t associated with the company that made the recliner. There are a couple of stand- out features that deserve to be showcased. Firstly, instead of massage rollers, it uses 4 wheel-driven massage hands, and you can combine massage methods and use more than one at a time. There are also 3 different zero-gravity positions. It uses a 3-D intelligent detect system to auto detect your body’s shape and size. There are 4 different auto programs that include: kneading, spinal rolling, vibrating and shiatsu. There’s a massage timer that can go from 5-30 minutes. There’s also a manual mode, if the auto programs aren’t your thing. You can control the rollers on any part of your body and control their intensity, their speed and control the air bags. 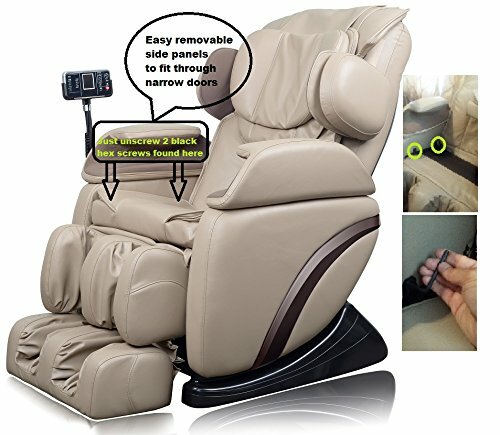 As for the foot area, there are 6 rollers for massage, and the foot rest extends 6 inches to accommodate taller people. All of the massagers in the recliner are muted, so they’re very quiet. The ability to combine massage settings. 3-D intelligent body detection system. The ability to manually decide what type of massage you want and where. May not be a good choice for heavy people. 6. 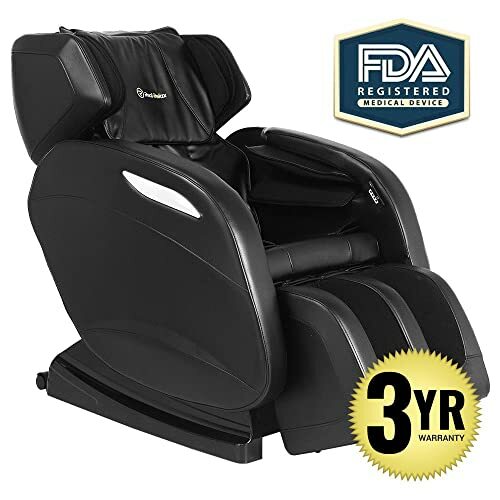 Suncoo Massage Recliner (Power Recliner- Black- 13 IN 1) – Great Features and Price. This recliner does nearly everything. It does a 360 degree swivel, meaning it will turn in an entire circle without you having to get up, it rocks, it lays flat, and it reclines using a lateral button. It has a seat width of 22 inches, a 250 lb weight capacity and it can fit people at least 6 feet tall, making it ideal for people of nearly any size. The frame is made from high quality, solid wood, which makes it safe and reliable. It’s also extremely comfortable. It’s padded with high-density sponge, which not only cushions it, but makes it not lose its shape easily. The arm rests are thickly padded and come with 2 cup holders for convenience. It’s designed to be ergonomic and support the neck, back and lumbar area. The back cushion is adjustable, meaning you can put it wherever you want. What’s more, it even has an 8 point massage system and heat therapy. Swivel, rock and recline features. Wood frame isn’t as durable or strong as metal. Not good for over 250 lbs. This recliner has a ton of features, which is excellent for the low price it’s being sold for. 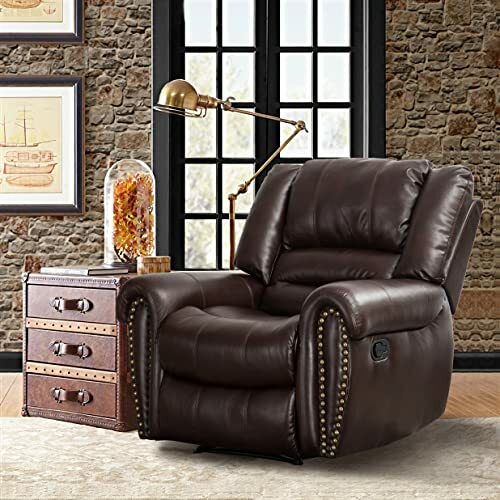 Not only is it an electric recliner that reclines at the push of a button on its remote control, it has a 360 degree swivel and a rocker function, making it good for all sorts of uses. It’s highly adjustable, with the ability to adjust the thickly padded arm rests and back. It’s upholstered with a high quality leather, which should last for years. It’s strong and durable, making it ideal for intensive daily use. The ergonomic design supports your legs, back and lumbar areas. It also has an 8 point massage, heating system and even a cup holder. That’s not bad for under $400. May not be good for tall people. 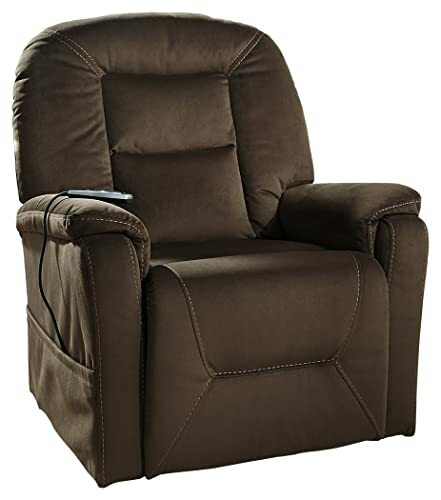 This power lift recliner has the kind sturdiness that one would expect, having been developed by Ashley Furniture, which has made and sold furniture for over 70 years. It’s got a powerful dual motor on it that makes it capable of moving the back and the footrest independently from one another. The controls are easy to use and they’re quiet. One can easily stand up from the fully lifted position. It’s very comfortable, being oversized, with pillow top arm rests and bustle backs for lumbar support. It’s made from faux leather, which means that while it looks like leather, it’s actually a very thick poly fiber that’s soft and comfortable. It looks good, as well, with its flashy nail heads along the trim and tufting. It’s also very strong and durable. The corner blocked frame and steel reinforced seat give it lots of strength and will ensure that it lasts a long time. It comes with a 5 year warranty. It doesn’t come fully assembled, but it is relatively easy to put together and the instructions are easy to read. Once you get it done, you’ll have a recliner that you can comfortably sleep in for years. Made by trusted name brand. This actually comes in 3 colors, so don’t let the product description fool you. You can get it in Camel, Chocolate or Sage. It’s a power recliner, which means you can put it in multiple positions with the push of a button. It even goes as far as to lay flat, which is great for sleep. It’s actually designed to be comfortable enough to sleep in, and advertised as feeling like you’re “floating on clouds”. Not only is it comfortable, it’s really strong and reliable. It’s got a steel base that’s really hard to bend. The seat is made from steel, as well and has an 8 gauge spring system for both support and comfort. It holds 250-300 lbs and can easily fit a person who is 6 feet tall in it. So, it’s not only good for every day intensive usage, it’s good for both heavy and tall people. Strong and durable with steel base. Not a lot of features. This is a good choice if you want a simple, no frills recliner to sleep in. It’s a manual recliner. You pull a lever on the side of the arm rest to recline and push in on the foot rest with your heels to close it back. The reclining mechanism is smooth operating and quiet. Even though it doesn’t have as many flashy features as some of the other entries on this list, it’s very durable, comfortable and fashionable, making a nice addition to nearly any style of décor. It’s upholstered with breathable bonded leather, with the addition of brass nails that add a bit of flair to the piece. It’s stuffed with high-density foam, so it won’t lose its shape easily. There are 2 overstuffed pillows on the head and the back. There’s also comfortable support for the back and neck and lumbar region in nearly any position or activity, including sleep. The frame is made from laminated veneer lumber (LVL) and the back rest is made from heavy-duty steel for stability that won’t bend or lose its shape. It has a 300 lb weight capacity, as well. All of this is extraordinary considering that it’s handmade. It’s a great, simple sleeper. Wood frame, not as strong as steel. You need to determine how large the recliner is that you’re considering purchasing before taking it home. There are things to take into account, such as whether it will fit through your door, and if it doesn’t, whether you can take the arms off to make it fit. It doesn’t fit if the only thing that fits in the room is the recliner. So, consider which room you’re going to put your new recliner in. If you thought it would fit in the bedroom, but it won’t, maybe consider putting it in the living room. You’ll also need to measure it in its fully reclined state. It does you no good if it fits in the closed position, but not fully reclined because that makes it virtually useless to you. If it only fits in the closed position, you’re missing out on using a lot of your recliner’s features. There is no one-size-fits-all type of recliner. On the contrary, there are several types and they’re all suited for different purposes. Lift chairs are a great option for elderly or disabled people, or for those with mobility issues. Their main feature is to lift the chair completely up, leaving the person seated in it in a standing position. They’re also good for pregnant women who are further along and have problems getting up and down. But, even if you have none of these issues, you could definitely benefit from the chair assisting when it’s time to wake up and get out of it because you most likely won’t want to on your own. These are pretty much exactly what they sound like: recliners with electric massage rollers in them. They’re good to combat stress and back pain. Some even have features like heat therapy and foot massagers, easing pain even further and melting away stress and muscle fatigue. They’re celebrated for helping those who have trouble sleeping, so even if you don’t, they’ll help to massage you right to sleep. These recliners allow you to gently rock back and forth, slowly lulling yourself to sleep. They somewhat mimic waves, relaxing and calming you. These classics are a favorite among pregnant women and the elderly. Often, they came with a swivel feature, making you able to simply turn the chair, rather than having to get up out of it. They’re an excellent choice for anyone because of their ability to calm you down and get you to sleep fast. They even work on newborns and infants, which means you can literally “sleep like a baby” in one. Quality construction is a must-have in any recliner. After all, you don’t want to lay down in your recliner to take a nap, only to have it fall apart with you in it. Besides being annoying and costly, having your recliner break while you’re in it is fairly dangerous. I’ve had it happen before with low-quality, old recliners, causing boards to come up and scratch me and leaving me with nasty wounds. With that in mind, look for metal frames, or frames that are reinforced at the joints. They’re sturdier than most basic board-panel frames and won’t lose shape as easily. You want your recliner to last a long time, not lose its shape, be safe and dependable, and support your back. The sturdier the chair, the more it will accommodate all of those needs. Let’s face it: no one likes a hard seat. The more cushioning there is, the softer and more comfortable your recliner will be. Look for keywords like “padded”, “extra cushion”, “soft pillows”, etc. The cushioning provides not only comfort, but support. Also, it’s important to know where you need your extra cushioning. If you have back problems, extra lumbar support will help. In my case, I have sciatica, so extra seat cushioning and lumbar support massively help ease the pressure off of the nerve and reduce the pain. If you have trouble through your shoulders and neck, look for recliners that have extra cushioning in that area. Extra cushions in the head/neck region also help for sleep, as well. In some cases, you might not even need to grab an extra pillow (or neck pillow) before you take your nap. No one wants the ugly old armchair of yesteryear. Sure, it was comfortable, but it stuck out like a sore thumb. So, you might want to consider if your recliner matches the rest of your furniture and décor in the room. If your room is mostly green, for instance, a bright red recliner may not look the best with the rest of your furnishings. Lots of recliners on this list have style and color options, or accents like brass furniture tacks. Sitting in a more upright position keeps stomach acid in the stomach, whereas lying flat in a bed lets it pass into your esophagus. So, sleeping in a recliner can drastically reduce pain from heartburn. Less heartburn means more, better sleep. Reclining your feet and legs can improve your circulation. It feels good to sit in a reclined position because your body is able to recharge from here. Add the regenerative properties of sleep to the mix and you’ll get twice as much recharge and rejuvenation. Plus, because of the increased blood flow, you’ll wake up actually refreshed because your body will get the blood flowing to the parts that need healing. It’s safe to say that you’ll wake up feeling better. People who have had heart attacks frequently have difficulty breathing during their recovery period. People with sleep apnea and other breathing problems have similar difficulties when sleeping in beds. These problems stem in part from gravity causing tissue to press down on airways when laying flat. But, they find it easier to breath in recliners because when they’re in an upright position, there’s nothing to press down on the airways. So, sleep in a recliner and breathe easy. Reclining our feet takes pressure off of our backs, which eases the pain. Blood also gets sent to the lower back in this position and starts the healing process. This may make sleeping in recliners even better for your back than sleeping in the floor. Buying one with massage and heat therapy features can ease the pain even further. Because most recliners are highly adjustable, it’s easier to find a comfortable position to fall asleep in. This means that you’ll fall asleep faster and you may enjoy better, more relaxed and restorative sleep because you’ll be more comfortable both before and during your sleep. Stress can not only make existing health problems worse, it can create its own brand of health problems, too. Not to mention, your mood and mental health can take a serious hit, as well. So, anything that relieves stress is massively beneficial to both your physical and mental health. Now you should have a better understanding of what to look for when shopping for a recliner to sleep in. Consider if you have health problems that could be alleviated by sleeping in a recliner, because if you decide to make the switch from bed to recliner, you’ll need a sturdy, durable one. If you’re just buying one for naps, you have other considerations, like whether you need a rocker, a massage recliner, or a lift chair. Also, make sure it’s something you’ll be comfortable in. It needs to fit you, and you it. It’s not going to suit you to have a recliner that’s too short or not wide enough because you’ll never get to sleep in it if you’re uncomfortable. Make sure you like how it looks, as well as how it feels. You don’t want any piece of furniture that doesn’t fit your style. And, lastly, make sure it fits your budget. I made sure to include several different price ranges in this article’s reviews to demonstrate that you can find a great, luxury recliner to sleep in on any budget. Now you can go forth with your new knowledge and find the absolute best recliner for you to sleep in! Deciding to buy a new recliner for sleep is only half the battle. You must also take care of it and perform routine maintenance on it to keep it in top shape. A recliner for sleeping is quite the pricey investment, so you’ll want to get the most out of it and use it for as long as you can. More often than not, no matter what the frame is made from, it’s covered with some sort of upholstery. The most common types are cloth, microfiber and leather. They all have different care instructions, so it’s useful to know what specifically to use on your recliner. Leather can be quite finicky and require a fair amount of upkeep to keep it looking pristine. Without the proper treatment and conditioners, it can crack and break. So, keep that in mind before purchasing a leather recliner for sleeping. First, make sure to vacuum the recliner and brush it off to get rid of any crumbs or debris that may have built up on it. Then, you’ll need to use both a leather cleaner and a leather conditioner on it. You’ll want to pat it, not rub it in. Repeat the cleaning and conditioning process once a week. Any time you put something wet on microfiber, it has a tendency to produce unsightly watermarks, but this method eliminates them.